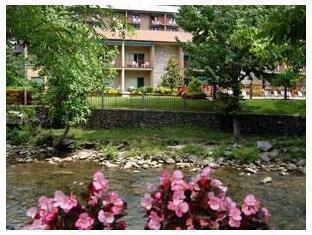 The River Terrace Resort is perfectly located for both business and leisure guests to Gatlinburg (TN). The River Terrace Resort boasts a convenient location with modern amenities in every guestroom and superb service. All of the guestrooms are replete with air conditioning, hair dryer, ironing board, separate shower and tub, microwave. To suit guests' convenience, this Gatlinburg (TN) accommodation offers 24hr room service, shops, bar/pub, laundry service/dry cleaning, meeting facilities. For guests to unwind, the hotel offers a variety of facilities and services including jacuzzi, outdoor pool. Modern comfort and convenience are seamlessly combined to ensure the guests' satisfaction. The hotel provides a warm and welcoming service of international standard. To make your reservation at the River Terrace Resort via our secure online booking form, please submit your visit dates.